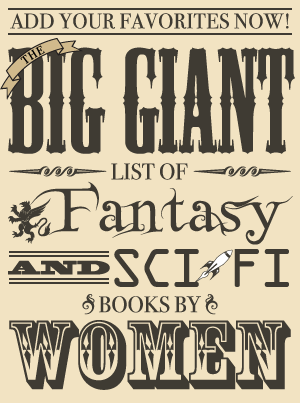 Today’s guest is fantasy writer Tessa Gratton! She is the author of several young adult fantasy novels, including Strange Grace, the books in the Blood Journals series, and the books in the United States of Asgard series. 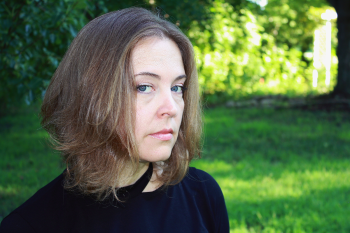 She has also published short fiction, including the stories “Beast/Beast” and “This Was Ophelia,” and she’s a writer for Tremontaine, a collaborative serial prequel to Ellen Kushner’s Riverside series. 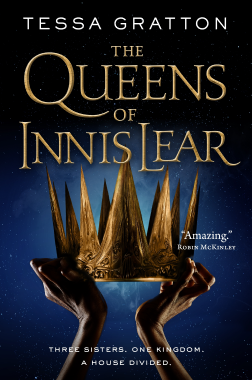 Her first adult fantasy novel, The Queens of Innis Lear, was just released in paperback—and it will be followed by another Shakespeare-inspired companion novel, Lady Hotspur, early next year! 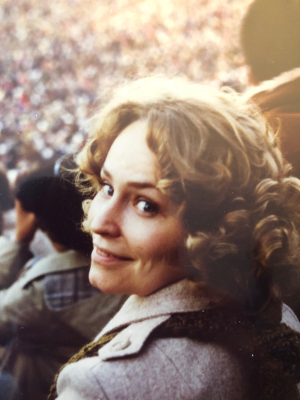 When my mom died last October, I tried to write a normal eulogy. The drafts were fine, but I’m a professional writer. I thought I should do better then fine for her. All my best work is fantasy, so I tried fantasy: I wrote little fairy tales about Mom, and even though she wasn’t really a dragon or a queen or a garden witch, the stories were still true. Once upon a time, a ferocious dragon made herself into a beautiful, clever woman in order to live a mortal’s life. She was passionate and eager to learn everything about people, about the world, and still as ferocious as ever, always ready to argue her cause, stand firm for what she believed in, but willing to change, too, when faced with equally passionate argument and evidence. As you know, the only way to kill a dragon is to find its heart, and so as dragons often do, this woman took out her heart and divided it into pieces, hiding shards inside her children, her husband, her family, and friends. Weakened by human mortality, the dragon’s fire burned up, and she died. But her heart remained hidden inside a hundred other hearts, and no other dragon has ever found a better resting place. I had vivid nightmares as a kid, and Mom told me to imagine a hero to help me out when I was afraid. “They’re your dreams, your brain is doing it, so put your brain in charge.” She recommended Superman or Princess Leia as excellent fellow monster-slayers. It worked. I don’t know if I believed her so completely that I learned to lucid dream, or if I’d have been able to do it regardless. The result was I grew up remembering my dreams, and often was aware that I was dreaming. I could usually wake myself up from a nightmare, or change it if I was having a strong-willed night, or if I woke from a good dream I could slip right back into it. I taught myself to fly at least once a month. Since Mom died, and for a few months beforehand, I’ve been too tired and sad for vivid dreams, or to remember them. My dreams lately are impressions and flashes and feelings, without storylines or the extravagant world-building I’m used to. Then early in March I dreamed about a murder mountain (don’t ask) and at one point I was in the car with Mom, strategizing how to save a bunch of people. I suddenly realized I was dreaming and that when I woke up Mom would be dead. I wanted to stay asleep forever. I wanted to talk to her about everything I’ve been trying to do since she died, I wanted to ask if she was ok. Of course I woke up almost immediately. Last year my debut adult fantasy novel was published. 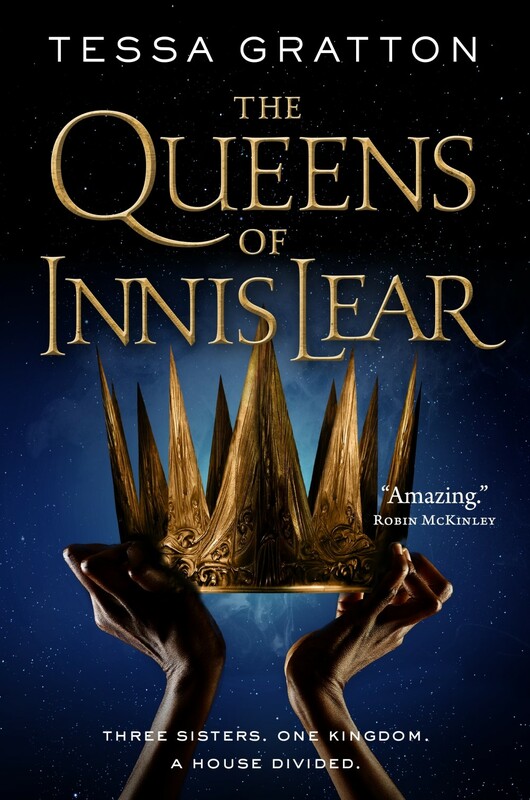 The Queens of Innis Lear is a retelling of Shakespeare’s King Lear, and is about how a mother’s death can leave a wound raw enough to ruin families, kingdoms, and magic itself. I wrote it because I’ve been frustrated with the play for twenty years. There’s no motherhood in the play whatsoever. Lear’s wife is never mentioned, and we don’t know if his three daughters have the same mother, different mothers, or ever knew her. The two eldest daughters are demonized by Lear for being childless themselves. In writing Queens, I wanted to deconstruct how a lack of concern for motherhood and care-taking, and the devaluing of women’s relationships, directly creates toxic patriarchy. It’s a fantasy novel because magic is such a useful tool for metaphorically pointing at our society’s problems—I’ve always been a believer in reading and writing speculative fiction as one of our most important methods for asking the right questions of our world. I wrote Queens before my mom even got sick. I cannot imagine what that book would be if I tried to write it now, or during her illness. When people ask why I write what I write, I used to easily respond that I write to change the world. Stories, even—no especially—speculative stories, can deconstruct oppression and fight imperialist thinking, they can ask questions with language people don’t always have in the real world. Stories changed me and I’ve always found power there. So I used to write to change the world. I meant it, and still do I guess, except that when I think about changing the world, right now there is only one thing I’d use all my power to change: I’d make more time for my mom. That’s impossible, and selfish, and Mom disapproved of selfishness more than anything else. But some days I don’t care about helping others, or compassion, or making the world better, because the world was fundamentally diminished when she died. I was diminished. Even if the world can get better, it will never get back what we lost when we lost her. I wonder, why do I write in this lesser world? Since 2011 I’ve had six young adult fantasy novels published. YA fantasy is where I laid the foundations of my career, and if you’re anywhere near it, you’ve probably heard people discussing the trouble with parents. That trouble being: parents are frequently written out or killed in a lot of children’s literature. Both because of the traditions of Western fairy tales that so strongly inform the genre, and the practical necessity of getting Mom and Dad out of the way so kids can have adventures. Of course there are many amazing children’s and teen books with active parents, and authors frequently find ways to engage with living, active parental relationships—it’s just that the trouble with parents is something every author has to think about a lot. Of my YA fantasies, there are ten main point of view characters. In four of the books one of the main characters’ mothers is dead before the book begins. In a fifth, one of the main characters’ moms dies before the end. There are three absent, though living, moms who abandoned their child for a variety of reasons (destiny, fear, shame). Only two of my ten main characters could possibly be said to have good moms, and of those, one is the aforementioned mom who dies by the end of the book. Taken as a pattern it’s not a good look, and I joked when I was writing Strange Grace that I wanted to put in the acknowledgement, “And hey, Mom, I finally managed a book where no moms die!” but it was not to be, alas. That said, I never truly worried about it, focusing instead on individual books and characters and what that story alone needed. Until my mom was dying. Mostly I think about what I got right and what I got wrong, and how different the experience of losing your mother must be at sixteen than it is at thirty-eight. I think about where to put motherhood, how to engage with mothering and care-taking through teenage relationships, and I realize again and again that even though mothers specifically are absent, most of my YA books engage with found families, with learning to make relationships, build communities, and fighting to make the world better. My mom, at least, has influenced my work in ways I had never considered before. I still don’t know who to be without her, but I think I know what she’d want me to strive for. Once upon a time, there was a daughter. When she was a child, her mother gave her a spell to let her control her dreams. But when her mother died, the power vanished. The daughter wandered, dreamless, powerless, because there was nothing to do except keep moving. Keep stumbling forward, keep acting, keep being. And as she explored the dark world, finding sharp edges, perils, and the new shape of the shadows, she slowly realized she was sad, but not afraid, because she remembered the sound of the spell and the curve of her mother’s smile. She thought maybe—maybe—she could rediscover her power simply by trying to use it. When I started to work on my 2020 adult fantasy in 2017, Lady Hotspur, I knew it needed a lot of moms in it. It’s a companion novel to The Queens of Innis Lear and is based on Shakespeare’s Henry IV, part i, with the characters shifted heavily or completely toward women on the gender spectrum. The play itself is about a prince and his relationship with his father, the king, and with his mentor, a clownish old knight. It’s about reputation and who crafts such a thing, about how we tell stories about ourselves and our relationships, and how those things make us vulnerable or strong, because our enemies can tell stories, too, and we can lie to ourselves. Here are some amazing facts: At the start of Lady Hotspur, nearly everybody’s mom is alive! Nearly everybody’s mom is active in their lives! Better yet, a lot of moms survive the whole book! And it begins with a mother coming home from exile and making herself a queen. I was about ten thousand words into the first draft when Mom was diagnosed with Stage IV uveal melanoma. This is a disease with a 85% attrition rate in five years. Mom made it about eighteen months. My writing was given a terrible new urgency, because more than any other book, this one is about me and my mom. It describes and deconstructs our relationship, which has been amazing, terrible, easy, impossible—so many things, because like her I am strong-willed and opinionated. She taught me to fight for what I believe in, that science can lead us to God, that we are here to make the world better, and to marry my best friend. Sometimes, our ideas about what would make the world better clashed, and we argued heatedly. I stopped caring about God, which was traumatizing for both of us. She didn’t expect me to literally marry my best girl friend, so we fought about that, too, for a while. But because neither of us forgot that one of the things we believed in and therefore had to fight for was each other, we came through it and for the last fifteen years my mom was one of my best friends. 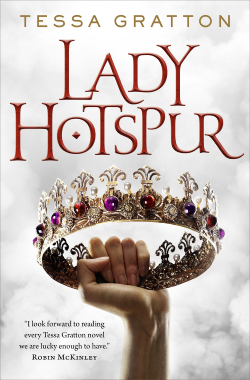 Lady Hotspur is about queens and lady knights, about generational trauma, about building a system that is better than the last, where maybe choosing love can literally reshape the landscape (because magic is real). It’s a fantasy with monsters and war and blood magic and wizards, because those are the tools I use to tell a true story. The dedication has been there since the first draft. I wanted to show her in a finished copy, but I didn’t finish in time. The week before she died, I was alone with her and Dad in her hospital room, and I knew I couldn’t wait. I pulled the manuscript up on my phone and showed her the dedication page, but she couldn’t really read anymore. So I read it to her, after a few shaky attempts. For my mom: you didn’t need to be a queen to make the world better. Outside, it might have been beautiful or storming, there might have been busses rushing past or crows yelling, and in the hallway the hospital moved along with its regular business, which can be surprisingly loud. But inside the room, we were quiet. Tessa Gratton is the author of Tor Books adult SFF The Queens of Innis Lear and Lady Hotspur, as well as several YA series and short stories, most recently the original fairy tale Strange Grace from McElderry Books. Though she’s lived all over the world, she’s returned to her prairie roots in Kansas with her wife. She is the associate director of Madcap Retreats and worked as the Lead Writer for Serial Box Publishing’s project Tremontaine. Visit her at tessagratton.com.